NeuWeb Review 2019: Is NeuWeb a Good Hosting? NeuWeb is a no frills company with a selection of dynamic and static hosting plans. If you’re looking for a budget option, and prepared to sacrifice a feature or two, keep reading! 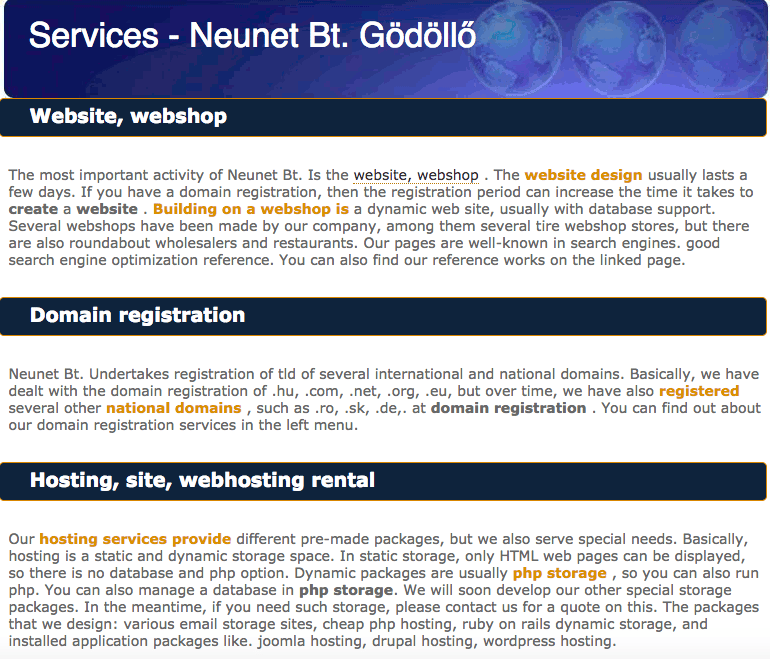 NeuWeb is a Hungarian based hosting which has been in business since 2006. The company aims to provide affordable website hosting with cheap, reliable servers. The website is provided in Hungarian. The servers are redundant, located in a Hungarian server room, and use a Linux operating system. The website advertises availability of more than 99.9%, however, there isn’t a service level agreement or anything in the terms and conditions about compensation for excessive downtime, which is a frustration of mine. This website primarily focuses on domain registration (in fact all domains come with hosting), however, there are also several straight hosting plans available. There is “Dynamic” hosting plans, “Static” hosting plans, FTP hosting plans. The static plans are for HTML only websites and as such do not support PHP scripts. If you’d like to run PHP, select one of the dynamic plans with MySQL databases. Let’s start with the Dynamic plans, of which there are six tiers of plans ranging from 100 MB to 5 GB of disk space. All plans come with unlimited bandwidth and except for the two cheapest plans, come with unlimited domains. These plans support PHP version 5 (not far faster version 7) and MySQL. There are five static hosting plans, ranging from 100 MB to 1 GB storage and, like the dynamic plans, unlimited bandwidth. These are basic plans designed for simple, static HTML website and / email hosting. As such, there is no support PHP, cron jobs, or MySQL databases. All of the plans are cheap. However, you’d hope so given the level of resources. There isn’t a huge amount of value added features. These are simple, no-frills hosting packages at an affordable price. Getting signed up is not that straightforward. First, you enter your details to place the order for the hosting plan, and, second, you need to sign and return the order form by email, post, or fax. Then you wait…less than three hours if you ordered just storage space, an unknown amount of time, if you ordered other services. The first year of hosting must be paid for upfront. Upon renewal, it is possible to pay on a monthly, quarterly, or monthly basis, and the price is adjusted accordingly. The prices are deeply reduced if you purchase a longer upfront. Just be sure to note that VAT, domain registration, and SSL certificates are all extra costs. Customer service is limited. You can call or email the company. There is a FAQs page however it is tiny and not likely to be any help if you need technical support. However, again, this is a budget brand and you can’t expect 24/7 support for this price. NeuWeb is part of Neunet, a Neunet Health and Informatics Service Company. It’s basic hosting company with little extra value other than the disk space and bandwidth allowances. Certainly, the dynamic plans offer PHP support and MySQL databases, however, that’s about all it does offer. Budget-friendly hosting available now at NeuWeb! 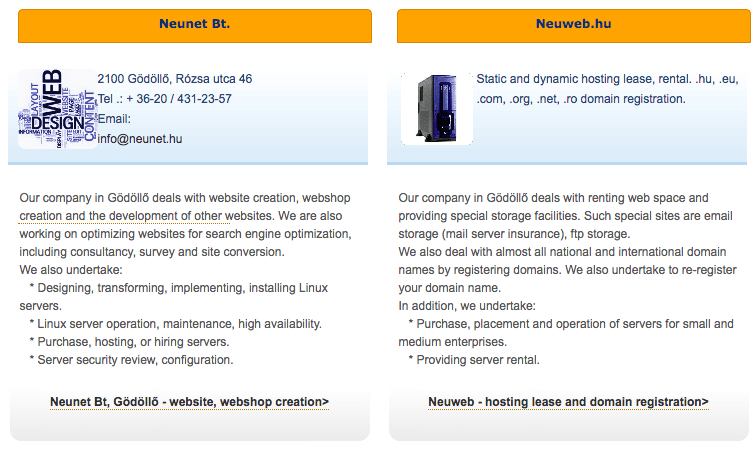 Wondering how NeuWeb stacks up against other Web Hosting companies? Enter any other Web Hosting company and we will give you a side-by-side comparison.